Want to bake but only know how to turn the oven on? This book is for you. As Gale Gand so eloquently stated, “This baking bible is the perfect mix of solid techniques, good advice and tried-and-true recipes.” Though the recipes in this book are on the easy side, I think it’s important to start out with these basics and perfect them. Then you can move onto harder and more challenging recipes that are complex. This book starts out by explaining the equipment and materials you will need for baking–measuring cups, measuring spoons, blenders and the like. It then goes through popular ingredients like flour and eggs and describes what each component contributes to baking with tips like, “eggs provide structure, richness, browning, and tenderness.” By understanding the role each element plays, it makes the recipe easier to follow and to understand. I love that this book has a variety of recipes ranging from savory biscuits and scones to popovers and yeast rolls, but it also has sweet recipes like brownies, coffee cakes, angel food cakes, and pies. With this book you get an introduction to baking from the first step for all types of food. One thing I wanted more of were “healthy” recipes using whole wheat and less butter and sugar. Even beginners should have the options to substitute out certain ingredients to make the recipe a little lighter. That said, the instructions in this book are extremely to follow, which is awesome for newbies and experienced bakers alike. I ended up making the basic butter cake on the front cover, which just looked too damn good. 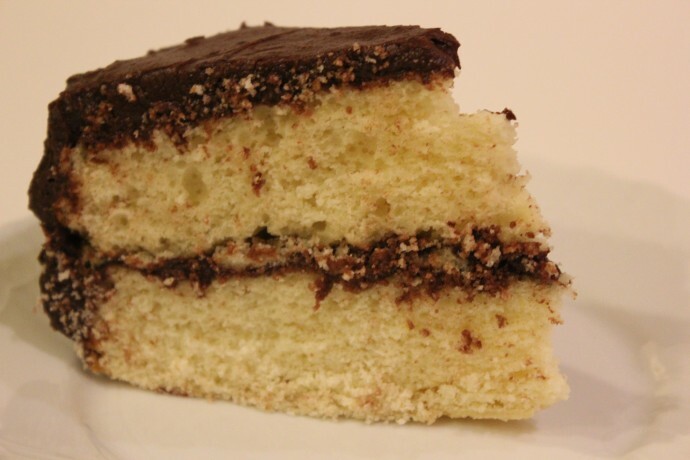 What’s more basic that a yellow cake with chocolate frosting? The frosting is actually to die for and I kind of liked it the second day right out of the fridge when it had hardened slightly. The cake itself was moist and fluffy, everything that’d you’d expect from a perfect yellow cake. I would maybe add less sugar in the frosting and even put raspberry jam between the cakes to hit some fruity notes. Which is just the right spirit. Since all of these recipes in this book are basics, once you master them, you can own ‘em by adding twists from your inspiration. Leave a comment below and tell us about your favorite thing to bake. Megumi Sasada is a Colby College graduate and currently works for an ad agency in NYC. She is an avid food-blogging (Every Last Morsel), Food Network-watching, nutrition-conscious acapella singer. Heat oven to 350°F with rack in middle. Butter two 9-inch cake pans. Then, using the bottom edge of a 9-inch round cake pan, draw 2 circles on parchment paper. Cut out and place one circle in the bottom of each pan. Sift the cake flour, baking powder, and salt into a medium bowl. Beat butter in bowl of a heavy duty mixer on medium until creamy. Gradually add the sugar, and beat 2 minutes. Beat in eggs, one at a time, scraping sides of bowl after each egg is added. Add vanilla and continue beating for 2 minutes until mixture is light and creamy. Reduce mixer speed to low. Add flour mixture in 3 additions, alternating with 2 additions of milk. Scraping down bowl after each addition. Beat until smooth, but no longer than 15 seconds. Pour into prepared pans and spread evenly. Bake 30 minutes or until a toothpick inserted in center of cake comes out clean and cake springs back when touched lightly. Cakes will be light golden brown and might be starting to pull away from pan sides. Cool 10 minutes on wire rack. To remove cakes from pans, run a small metal spatula around edges of pans, loosening sides of the cake. Place a wire rack over top of cake adn carefully invert. Peel off the paper and turn cake right side up, using a second rack. Cool compeltely, about 3 hours. Assemble the cake by topping the first layer with the creamy chocolate frosting then topping that with the second cake layer. Frost the top and sides, smoothing it with an offset spatula. Combine powdered sugar, cocoa, butter, 6 tablespoons milk, and vanilla in bowl of heavy duty mixer. Beat on medium until smooth, scraping down sides of bowl occasionally. Dilute with additional milk until frosting is spreadable but firm enough to hold swirls. Thank you for sharing this awesome book! My absolute favourite thing to bake is banana bread. I love adding little bits like chocochips, nuts or other fruit inside and out to be a little creative. My grandma’s italian egg biscuits. No matter how many times I make them they never seem to match my grandma’s, but that does not keep me from continuing to try. I love to bake brownies, they’re my go to when I’m craving chocolate. I love baking homemade breads. our favorite is beer bread and to mix dates, nuts ,or even raisons inside. A moist cake or homemade brownies for sure ! I love to bake cookies, pretty much all kinds and I’m also getting into bread baking lately. Yesterday I made honey whole wheat bread which I’m excited to have with breakfast today. just call me cookie monster! I love to bake lemon cake…yum! I also make it without frosting since I find it to be absolutely perfect without it. I will also try this great recipe that was shared.Thanks and I hope I can win! I like to bake cake! Yum! I love to bake pita bread =) It’s so easy and it’s fun to watch them puff up. Fresh hot homemade pita is the best. Existing subscriber, is this international? Would love to win this book to improve on my amateurish baking skills. I love to bake cupcakes! My favorite easy thing to bake is banana bread. My mom taught me how and I love it! I always have bananas in the freezer ready to become bread. My new favorite complex thing to bake is the hazelnut Nutella cake I made my husband for Valentine’s day. I used a recipe I found online that is based off a Nigela Lawson recipe. It took many many steps and made many many dirty dishes but it was well worth it! Pumpkin chocolate-chip muffins. I tried these for the first time in 7th grade and have never liked another muffin better. They’re the perfect mix of sugar and spice! My favorite thing to bake is banana chocolate chip bread. Individual peach cobblers- I got the recipe from Joy the Baker last year and I can’t stop making them! You just halve a peach, scoop out the center, and stuff it with cobbler topping. Twenty minutes in the oven, and suddenly you’re a lot more popular with your roommates and all of your other friends that just ‘happened’ to stop by two minutes before they come out of the oven.